Using a debit card with no foreign transaction fees is the cheapest, most convenient way of getting local currency overseas. This removes the hassle of having to negotiate conversion rates at a currency exchange (whose conversions rates are typically subpar) and also reduces the risk of carrying around huge amounts of cash. Still, ATMs can also be a minefield with local bank fees – and in Thailand, this is a real issue with one of the highest fees in Asia. As both a travel hub and one of the top destinations in Asia, you’d think that Thailand would make it easy for foreigners to get money from ATMs – but sadly, this wasn’t my experience. Since 2014, most of the local banks charge a 200 baht fee for all withdrawals, which is about the price of six Pad Thai meals! So after weeks of getting ripped off, I did my research and found two options for avoiding ATM fees in Bangkok. Some travellers that I met in Thailand (and some blogs) have reported success with withdrawing cash from their debit card from various Thai bank branches. I’ve been told that while some banks will try and charge you the 200 baht fee anyway, keep trying until you find someone who’s willing. They’re not meant to charge a fee – but like a lot of things in Bangkok, you’re at the risk of being ripped off if you don’t know what you’re doing. I never needed to try this due to the next method, but I can see how it might be useful – especially if you’re somewhere else in Thailand (without Citibank ATMs) and need cash. There are three Citibank ATMs scattered around Bangkok, often attached to an actual bank branch. These are fee-free for foreign cards, but make sure that you have a debit card that doesn’t charge international fees! As an Australian, I picked up a Citibank debit card years ago. Aside from prepaid traveller’s money cards (which are super expensive in their own way), this is the only debit card offered by Australian banks that doesn’t charge fees for international transactions or for using foreign ATMs. If you’re a traveller from the US, I’ve heard great things about Charles Schwab. Crunching the numbers with the exchange rate at the time, I discovered that my conversion of $189.31 to 5000 Baht was almost identical to the offical rate found on XE.com (a difference of less than 25 cents). I would find it hard to believe that any non-bank currency exchange company could offer a rate that even comes close to this exchange rate, especially after including the standard commission or transaction fee! After years of travelling, I’ve only come across one currency exchange (in Amsterdam) that offered anywhere near reasonable rates. To find this map on the Citibank website, go to this link and search for “Bangkok”. The Citibank website lists the following addresses, but don’t try to Google them – it doesn’t really work. To make it easier for you, I’ve found the correct locations that you can find by clicking on the relevant link. The CentralWorld Citibank ATM is in the far corner of the fourth floor of CentralWorld, near all the other bank branches. The shopping centre is big, so if you get lost, ask the information desk and they should be able to point you in the right direction. The Interchange 21 Citibank ATM can be found in the building with the huge Citibank sign (see photo above). If you’re facing the sign, it’s on the left, next to Family Mart. It’s a little tucked away, so if you can’t find it, go inside Interchange 21 and ask the bank branch for directions. The Silom Citibank ATM is relatively easy to find as it’s right on the road. Have a look at the photos (or Street View) on Google Maps to see what the building looks like before heading over. 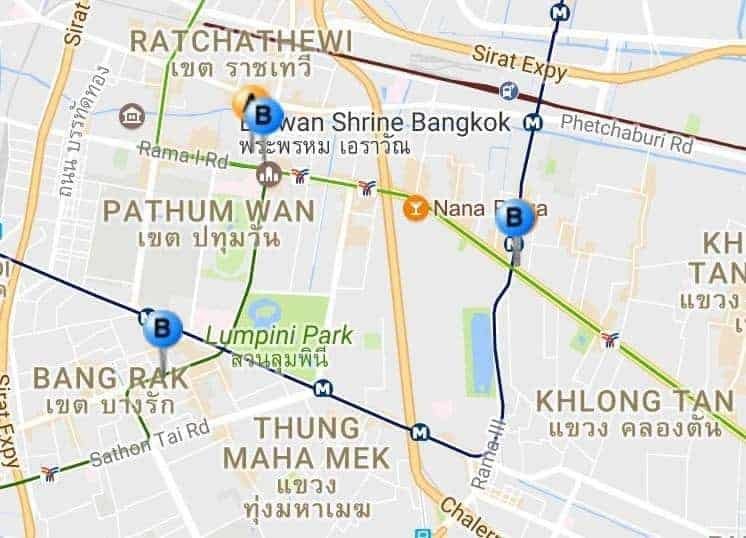 Personally, the CentralWorld and Interchange 21 Citibank ATMs were the closest by for me, and I withdrew money multiple times with no issues whatsoever. I’ve heard some reports that there is also an ATM in Chiang Mai, but other sources have reported that this is either false or the branch has been closed down. So if you’re starting your trip from Bangkok, I’d recommend heading to a Citibank ATM as soon as possible and withdrawing some Baht before heading off. Bangkok is right in between Thailand’s northern and southern tourist locations, so it’s even possible to schedule in a pit stop halfway through your trip. If you can’t find a Citibank ATM and the counter withdrawal isn’t working for you, you might just have to accept the fee. Still, not all ATMs are equal! AEON Bank is a Japanese bank that charges a slightly lower fee – 150 Baht compared to the standard 200. Krungsi Bank allows you to withdraw up to 30,000 Baht each time, which is the largest amount of any ATM in Thailand. Most ATMs allow around 20,000. If you’re going to pay the fee, you might as well try and minimise the number of times you need to withdraw cash from the ATM! Use card. Since it’s safer not to carry too much cash, it’s a good idea to try and use your credit or debit card (without international fees, of course) whenever possible. Street vendors won’t accept card, but you might have better luck at cafes, restaurants and bars. Pay in local currency. If you’re pay by card, the shop owner might ask if you want to pay in the local currency or in your home country’s currency. If your card doesn’t have international fees, always choose local. In-store conversions usually incur a fee, or a subpar conversion rate. If you play your cards right (sorry, couldn’t help myself), you might earn some airline miles as well. Bargain, but within reason. Seriously, don’t try and haggle over 10 Baht at a street food stand. Don’t be that guy. But if you’re getting a taxi or buying a pair of elephant pants, start with the assumption that they’re overcharging and bargain to your heart’s content. Book bus and train tickets online. After spending a month booking tickets through local travel agents, I realised that tickets are far cheaper online since prices are non-negotiable and don’t charge huge commissions. 12Go.Asia covers all of South-East Asia and shows you the prices for not only buses, but even trains, taxis and flights – all in one search. Booking in advance also tends to be cheaper, so be sure to check out the 12Go.Asia website before you set off. Hey Lucas! That’s a real shame. Out of interest, which card were you using? Hi, do Citibank ATMs in Bangkok also use 6 digit pin? Hey Irma! Unfortunately I don’t have any personal experience with this, but some quick research has shown that most travellers have successfully used ATMs in Thailand with a 6-digit PIN (notably with SCB, Bangkok Bank and Thanachart ATMs). I would assume that Citibank would accept it as well, but other travellers have recommended changing the PIN to 4 digits before travelling – just in case. Hope that helps! Hi Chris, do you use the Citibank ATMs or withdraw in the bank (over the counter)? I will be staying near the Silom Road Citibank and using a Citibank Debit Visa Plus card. Hi Dawn! I’ve always used the Citibank ATMs with the same debit card as yours, so it shouldn’t be a problem. The counter withdrawal method is an option I’ve heard of from other travellers when the ATMs don’t work out – but it shouldn’t be necessary in your case. Enjoy your time in Thailand! Hi Chris, just wondering if you can use other Aussie cards ( nab/anz ) in the Citibank atms and avoid the fee or must it be an actual Citibank debit (not credit) card ? Hey Firo, in theory you should be able to use any Mastercard or Visa card at any ATM (not just Citibank). The reason I recommend the Citibank debit card is because it doesn’t have any international transaction fees, and the Citibank ATM doesn’t charge any local bank fees. Hey Fadi, thanks for your kind words. Yeah I’ve also been amazed at how few people seem to understand how it all works, and even more so with those that have been so unwilling to learn. Hope you’re enjoying Koh Samui mate! What about Thai issued debit cards with a Thai bank account, do they also have to pay the 200 Baht? Assuming you are able to open an account. Hey Glenn, I can’t really help you here as I’ve never tried opening a Thai bank account. Unless they say otherwise, I would imagine that withdrawing money from your bank’s ATMs would be free, while other bank ATMs might charge a fee. This is a pretty universal concept in most countries. I’ve met people who have opened bank accounts in Thailand, so it’s definitely possible – you’d be best off contacting them directly to ask them for more details. For those who have Polish Citibank cards: Citi converts currencies using the Mastercard exchange rate when the card is hooked to EUR account while you use the card for payment and for withdrawals at any other ATM than the ones belonging to Citi. While witdrawing at Citi ATM they convert at Citi exchange rate which is much less attractive. Hence, if you have a Polish Citi card, avoid Citi ATM’s. Hi Jorn, thank you for the heads up! Is there no option to select whether you want to use the Mastercard rate or the Citibank rate? It’s not uncommon for ATMs and POS machines to give you an option (with the Mastercard rate being much better). Also, do other ATMs charge a fee with the Polish Citibank card? If the fee is a few hundred Baht, it might be worth it to just take the hit for the poor exchange rate – but it’s up to you do the math! Get an ING bank direct debit card. They don’t charge you overseas currency conversion rate and will rebate any fees charged by a foreign atm at the next month if you deposit 1000AUD into your account regardless of how much you use (Just transfer between 2 bank accounts by setting up automatic transfers if you are not earning that much of monthly income). Thinking of heading to Thailand? You might be interested in learning how to get a SIM card in Thailand. We’ll guide you through the entire process, as well as comparing the three main networks (AIS, Dtac and TrueMove). When booking a bus or train, be sure to check 12Go.Asia for complete coverage over South-East Asia.